Want to go paperless in your therapy practice, but not sure where to start? Ultimately, the system you choose will depend on your needs, practice size, and budget. We created this guide to help you better understand what therapy software is available, and which tool is right for you! What features should I look for in a billing & practice management tool? How much does each management tool cost, total? How much will each management tool cost for my practice? What features should I look for in billing and practice management tools? Customizable note-taking platform: Individual notes, group notes that you can share internally. What billing and practice management brands are available? Other tools, like Office Ally, are designed for billing and software, but not necessarily equipped for total practice management. 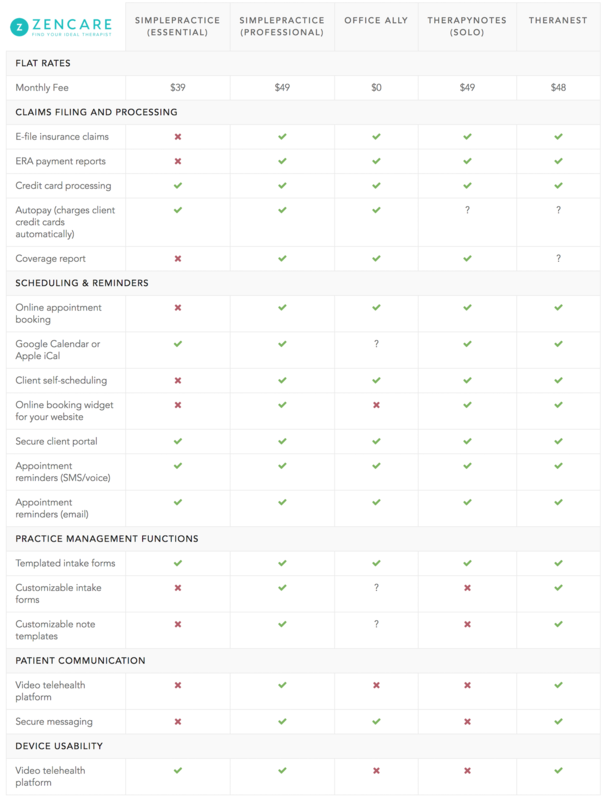 How much does each billing and practice management tool cost? The cost of hiring a billing professional can range from 10% of all billed services, to a percentage of the amount collected from insurance. See a full breakdown and cheatsheet of costs and features at the end of this article! Let’s consider a few private practice scenarios to see how your costs might play out. These consider factors such as your caseload size, how many private pay vs. insurance clients you have, how many clients pay using a credit card, and whether you want text appointment reminders. We’ve assumed a solo practice with a 25 client per week caseload, and that you opt into having text appointment reminders in all cases. We reached out to all platforms to confirm features and costs where details weren’t publicly available. As of the writing of this article, we have not received confirmations from Office Ally and TheraNest, so we’ve included placeholders as necessary. Office Ally is by far the lowest cost option in all scenarios — it’s free other than a flat rate for appointment reminders! — so consider the cost differences between SimplePractice, Therapy Notes, and TheraNest. In this scenario, you’re seeing 25 insurance clients per week, all of whom pay through a health insurance that you are in-network with. Below is what your true monthly cost would be for each platform. Office Ally is the lowest cost option, and SimplePractice follows suit. Because TherapyNotes has a flat fee of $13.50/mo for its credit card processing feature, it’s more costly at low credit card transaction volumes. Let’s now say you’re seeing 25 clients per week, half of whom pay through their insurance, and half private pay at a rate of $150 per session. In this scenario, we assume all clients pay their session fees with a credit card. Because of credit card processing fees at high volumes, SimplePractice’s monthly cost goes up, but approximately equals that of TherapyNotes. Now let’s take a full private pay caseload. You’re seeing 25 private pay clients per week, all of whom are paying $150 per session, and use a credit card to pay their fee. At this high volume of credit card processing fees, SimplePractice’s costs are higher than that of TherapyNotes. You’re seeing 25 private pay clients per week at $150 per session, and all of whom pay in cash. Want to see a comparison of all features and costs across platforms? Use the table we compiled below! You can download and print out this cheatsheet, too. Autopay (charges client credit cards automatically) ? ? Google Calendar or Apple iCal ? And if you’re starting or looking to grow your private practice, and want to join a supportive community of vetted providers, join the Zencare therapist network. You can ask questions via our active email listserv, build a professional online presence, and receive referrals for clients who are a great fit your practice! Schedule a free call with our Therapist Success Team today to learn more. This is part of our series on the best billing and practice management software. For further reading, visit our reviews of TherapyNotes, TheraNest, Office Ally, and SimplePractice, as well as an objective comparison of TherapyNotes vs. SimplePractice.